Great breezy racing and Aero-batic freestylin! 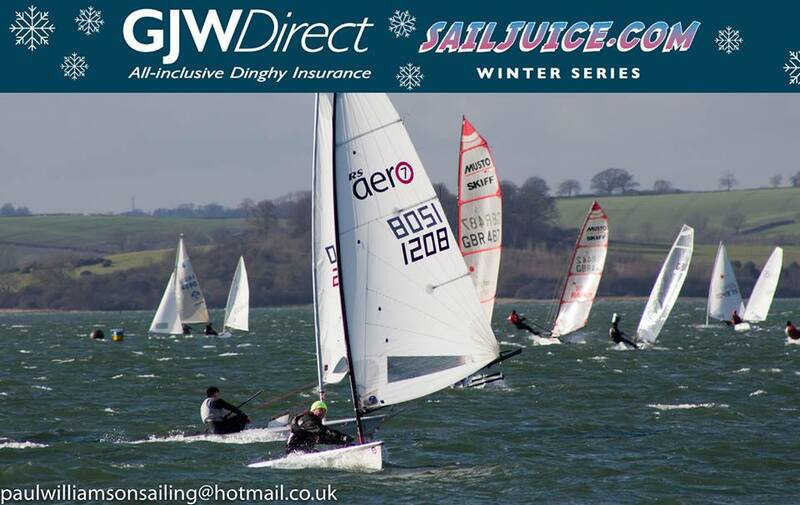 The 2016 John Merricks Tiger Trophy at Rutland SC included round 7 of the 9 event RS Aero UK Winter Series. The forecasts said it was going to be big, and big it was. As we arrived at Rutland the clubhouse's location led to a false sense of security, with an off the shore Southerly, the gusts could be seen racing into the distance. We were soon screaming downwind, surfing down 'proper' waves, holding on as the next 30 knot gusted slammed into you from any rearwards direction it fancied. Most sailors headed for the leeshore for some respite from the building breeze, watching the race team trying to set a startline. After a while the rib drivers were making that 'throat cutting' gesture and we knew we were now to head back to the clubhouse, into the 35 knot gusts. Rugby was to be the sport of the day and of course that rare Villa win. Sensing there would be no racing on Saturday, Martin immediately focused on his freestylin. Straight off the windward shore and generously right in front of the packed clubhouse of spectators he nailed his first ‘AeroEndo’ in one take. Thanks to Martin for gamely sharing his Aero-batics, 10/10 for that one! No RS Aero sailors were harmed in the making of this film, quite the contrary looking at the beaming grin from Martin during and after, once he had overcome his surprise! The lesser spotted flat water nose dive can catch the unwary out in very gusty conditions when the of the rig wants to accelerate faster than the hull is able to keep up. You can be at risk when you are travelling slowly in a lull when the front edge of a big nasty gust hits you unexpectedly from behind - hence it can take you by surprise! 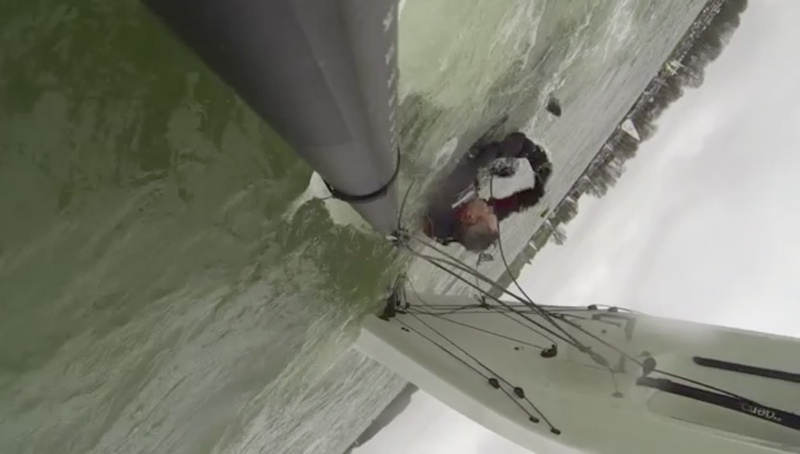 This is not likely to happen in flat water after you have accelerated. Remedies are to keep an eye out behind you and move backwards in good time. Luffing a little will give less nose down force, the boat well accelerate rather than suffering a stalled pressure build on the main. Luffing then also enables you to move to windward of the centerline and thus back behind the front of the rudder. Keep your front hand ready on that mainsheet, ready to give it a big pull if you get a wobble to windward! Sunday brought similar conditions - and the potential for more freestylin! There were no illusions as to what we were going to face 'out there'. Three RS Aero 7s made the call to go, Matt Thursfield, Rich Watsham and Andy Snell. The race officer set a perfect trapezoid course that offered everyone in the 75 boat handicap fleet something. For the RS Aeros, it was the bottom reach. OMG. That was amazing. Proper swell, the biggest breeze, the perfect angle. Credit to the PRO for getting that bang on. The angle meant you could bear off on the increasing gusts and let the boat fly, not worrying about where the leeward mark was, you just ended up at it!!! In race 1, Rich and Matt had a race length battle to the death, no more than 5 boat lengths in it as we crossed the line, Andy not far behind. Race 2, Matt stretched his legs, this time Andy and Rich a boat length apart at the line. Race 3, a full on squally breeze, survival of the fittest, Matt hanging onto lead Aero from Rich after a last gybe capsize, Andy again not far behind. Overall we were 26th, 29th & 45th, not bad considering the quality of racers who went out there today. Personally my envelope has been widened this weekend; you can efficiently depower a 7 rig with everything bang tight and then ease it all up again ready for the sleigh ride downwind! Next up on the UK Winter Series is the Roadford Rocket in Devon on the 28th February and with Matt now having scored his second win in the series the stage is set for a grand finale showdown at the final event of the series, the RS Aero Spring Champs at Grafham on 19/20th March, where the overall win and top positions are all up for grabs. Any sailors keen to join our Winter Training at Northampton on 13/14th Feb or Hayling on 12/13th March please contact Peter Atkin on [email protected] .